We present the fourth part of Henri de Villiers’ article on the Lenten stations observed by the church of Paris, in an English translation by Gerhard Eger, also published on Canticum Salomonis. The French original was published on the blog of the Schola Sainte-Cécile; since it is fairly lengthy, we have broken it up into six parts, each covering the stations celebrated that particular week. See part one for a general introduction. 8. Monday of the Third Week of Lent: station at the abbatial church of Sainte-Geneviève-du-Mont en l'Université (Sancta Genovefa de Monte in Universitate). On the left, Saint-Etienne-du-Mont, and on the right, the ancient abbatial church of St Genevieve. This famous Parisian abbey was founded in 502 by King Clovis and his wife Queen St Clotilde on Mount Lucotitius, where there was already a cemetery called the monastère des Saints-Apôtres, originally dedicated to the Apostles Peter and Paul. St Genevieve had the custom of praying there and took a path that would later become the Rue de la Montagne-Sainte-Geneviève. When she died in 512, her body was buried in the crypt of the abbatial church next to that of King Clovis, who had died and been buried there the previous year. They were joined in 545 by Queen St Clotilde. Several councils were held there during the 6th and 7th centuries, notably in 577 against Prætextatus, bishop of Rouen. Ravaged by Viking invasions in 857, the abbey was not rebuilt until the beginning of the 12th century by Stephen of Tournai; at the time, it was under the order of Cluny. During the trial of the Templars, a pontifical commission used the abbey as its headquarters from August 8, 1309 to June 5, 1311; nearly 600 Templars came there to defend their order. On June 24, 1667, Descartes’ copper coffin was placed there under a marble monument. A procession with the relics of St Genevieve, which was held every year on November 26th to commemorate the “miraculum ardentium”, which took place in the year 1129. The Parisians were saved from an epidemic of “the burning sickness,” a series of painful symptoms, including a burning sensation in the extremities, caused by ingesting grain contaminated with ergot. 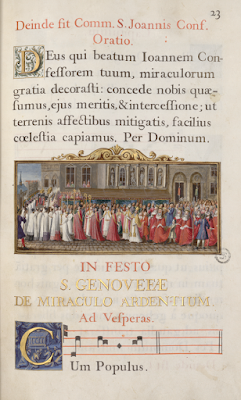 The epidemic was ended when the relics of St Genevieve were paraded around the city, and the procession was continued for many centuries afterwards. This image comes from a “collectarium” made for the prior of St Genevieve in 1711, a book which contains only the celebrant’s parts for the singing of the Divine Office: the intonations of the relevant antiphons, the chapters, and the collects. The abbatial church was famous for holding the relics of St Genevieve, patroness of Paris; grand processions with these relics marked the great crises in the history of the city and of France. As the headquarters of the congregation of Augustinian abbeys known as the Génovéfains, the abbey enjoyed great influence throughout Europe beginning in the 17th century. This congregation, set up by Cardinal de la Rochefoucauld, abbot of Sainte-Geneviève, had the goal of effecting in Augustinian abbeys the reforms demanded by the Council of Trent. During the 18th century, the ancient abbey was falling in ruin and King Louis XV, in fulfillment of a vow he made during an illness in 1744, decided to build a vast new basilica to replace the old church, placed further to the west over the abbey gardens. The project, entrusted to the architect Soufflot, began in 1758 and was finished in 1790. On April 4, 1791, however, the Constitutional Assembly secularized the church of Sainte-Geneviève and transformed it into a “Pantheon for great men”. 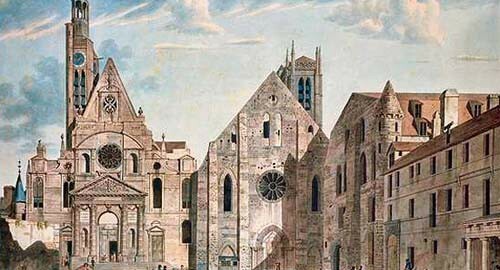 What remained of the old abbatial church was demolished in 1807 to make way for the Rue Clovis. Of the original church, there only remains the clocktower, known today by the name of “tour Clovis” (Clovis Tower), placed inside the Lycée Henry-IV, itself composed of the old conventual buildings of the abbey, which date from the 13th and 17th centuries. Napoleon I gave the building over to Catholic worship by a decree of February 20, 1806, but the July Monarchy secularized it again to remake the Pantheon. The future Napoleon III restored the building to Catholic worship by a decree of November 6, 1851 and the Third Republic suppressed it on July 19, 1881. 9. Wednesday of the Third Week of Lent: station at the abbatial church of Saint-Victor au dit faubourg (Sanctus Victor in suburbio ejusdem). The Abbey of St Victor in 1655, in an engraving by Mérian. Around 1108, the famous theologian William of Champeaux retired from teaching with some disciples and moved into an abandoned hermitage next to a chapel dedicated to St Victor, on the foothills of Mount Sainte-Geneviève. In 1113, when he was elected bishop of Châlons-sur-Marne, Louis VI the Fat transformed his little hermitage into a richly endowed abbey, and the following year, the pope confirmed the foundation. William’s successor was Gilduin, his most beloved disciple and the king’s confessor. Born in Paris, he was abbot from 1113 to 1155, and wrote a rule—the Liber ordinis Sancti Victoris—characterized by rigorous asceticism, where silence and manual work were dominant. Because of the personality of its founders, Saint-Victor quickly became an intellectual center of the first rank: its school foreshadowed and contributed to the foundation of the University of Paris in the following century. Ss Bernard of Clairvaux (1090-1153) and Thomas Becket (1118-1170) both made retreats here, and the bishops of Paris had an apartment in the abbey. 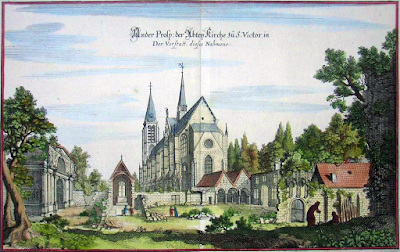 At the death of its first abbot Gilduin in 1155, the abbey already presided over 44 foundations, and a letter from Pope Gregory XI dated July 2, 1233 lists 70 daughter-houses, not only in northern France, but also in Italy, England, and even Denmark. In 1237, a chair of theology, linked to the University of Paris, was established there. At the beginning of the 14th century, most of the 12th-century buildings were destroyed and replaced by new, bigger, and better-lighted structures. 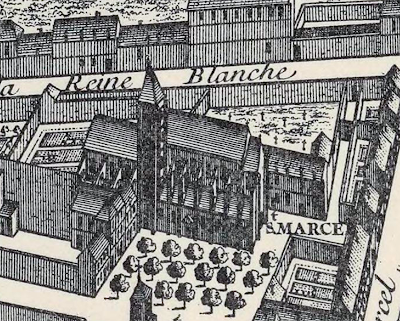 Nevertheless, beginning in 1350, the abbey faced several difficulties and, despite several reforms, it was finally absorbed by its great rival, the Congregation of France (Génovéfains) in 1633. 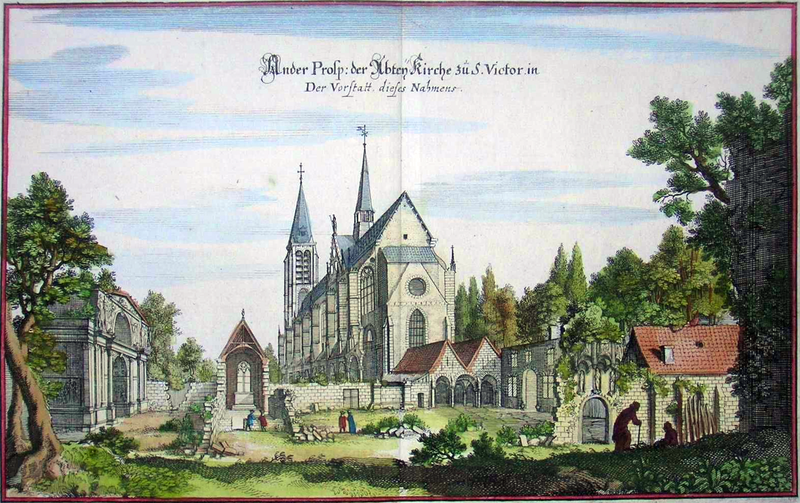 The Abbey of Saint-Victor was suppressed in 1790, but the abbatial church became a parish in 1791; the buildings were then sold as nationalized property, before being finally demolished in 1811. They were situated on the site of the current Université Jussieu and the Ménagerie du Jardin des Plantes. One of the last vestiges of the interior of the abbey, the so-called Tower of Alexander, upon which the Saint-Victor Fountain was raised, was destroyed together with the latter in 1840. 10. Friday of the Third Week of Lent: station at the collegiate church of Saint-Marcel au dit faubourg (Sanctus Marcellus in suburbio ejusdem). 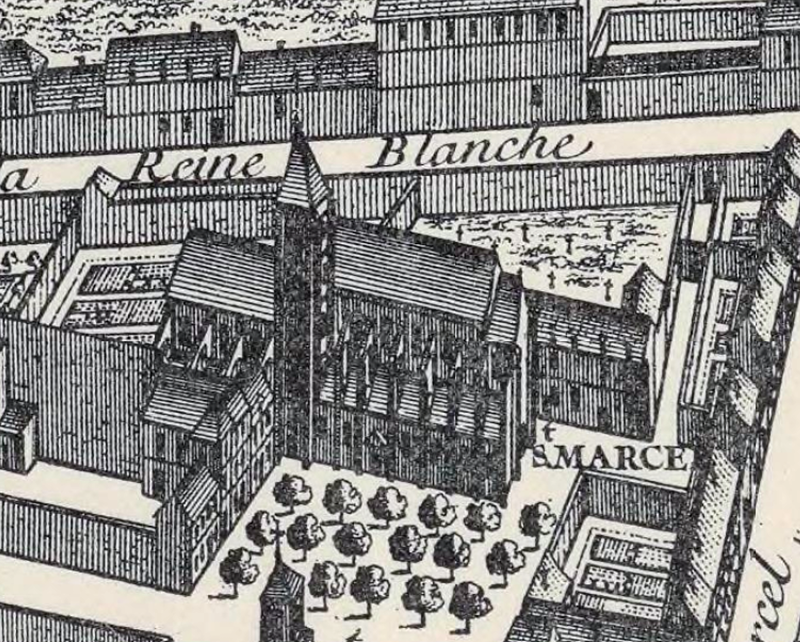 The collegiate church of Saint-Marcel on the Turgot plan of 1739. St Marcellus is the ninth bishop of Paris whose name has come down to us. He was born in 505 in Paris, on the Île de la Cité, to a humble family living near the Petit-Pont. Having become bishop of Paris, he protected St Genevieve and performed several miraculous healings; he is honored as the third protector of Paris, together with Ss Dionysius and Genevieve. When he died on 1 November 436 during the reign of the Roman Emperor Theodosius II, he was buried near the southeast exit from Paris, in one of the cemeteries which ran along the old Roman road. A little later a church was erected over his tomb, which became gradually surrounded by houses. During the 6th century, this place had enough homes for Gregory of Tours to call it a vicus (village); this is the origin of the Faubourg Saint-Marcel (in the current 5th and 13th arrondisements). This original church was destroyed at the end of the 9th century during the Norman invasions, but the relics of St Marcellus were kept safe in the cathedral and preserved. Around 1040 a new church was built over the ruins of the old and became a collegiate church in 1158. This collegiate church was of considerable size, with a nave about 50 metres long, 38 metres wide at the transept; its crypt housed the Saint’s tomb. Peter Lombard, the 72nd bishop of Paris and teacher of Philip of France, son of Louis VI, was buried there in 1160. Until the 17th century, the collegiate church remains outside the walls of Paris. It was closed during the Revolution in 1790 and then destroyed in 1806. Its last vestiges disappeared when the Boulevard Saint-Marcel and the Rue de la Collégiale were laid out (their names preserve its memory), with the exception of one of its towers, which survived until 1874. Today, a boundary stone of the city of Paris, set up on the Boulevard Saint-Marcel around number 81, reminds passers-by of the existence of the old collegiate church.